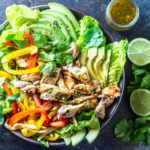 Chicken fajita salad loaded with sauteed bell peppers and onions, avocado, juicy chicken, and crunchy lettuce all drizzled with a flavorful cilantro lime dressing. Ready in less than 20 minutes. Guys, I am so ready for salad season. Can you tell? Last week I posted my go-to crunchy Thai Noodle Salad. 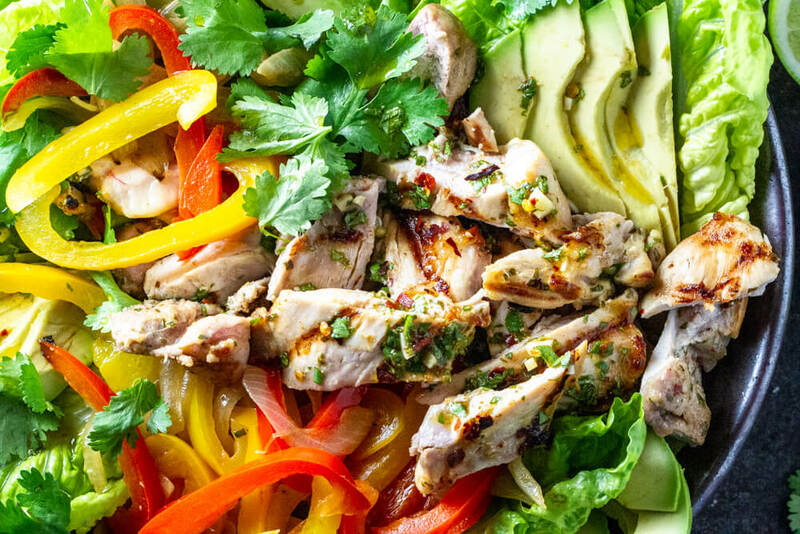 Today, I’m continuing the salad party with my crowd-pleasing Chicken Fajita Salad. It’s so easy to make and full of flavor. I honestly don’t eat a ton of raw foods in the winter, but as soon as Spring comes around, I’m craving all the crunchy vegetable things. And I don’t advocate any specific type of diet, my motto is “just eat lots of vegetables. ” You really can’t go wrong with feeding your body lots of super important nutrients, minerals and fiber. Did you know that the wider the range of plants that you eat, the more diverse your gut bacteria will be? And we can all use a bit of help getting our gut biomes in shape these days, am I right? …dressing/marinade. 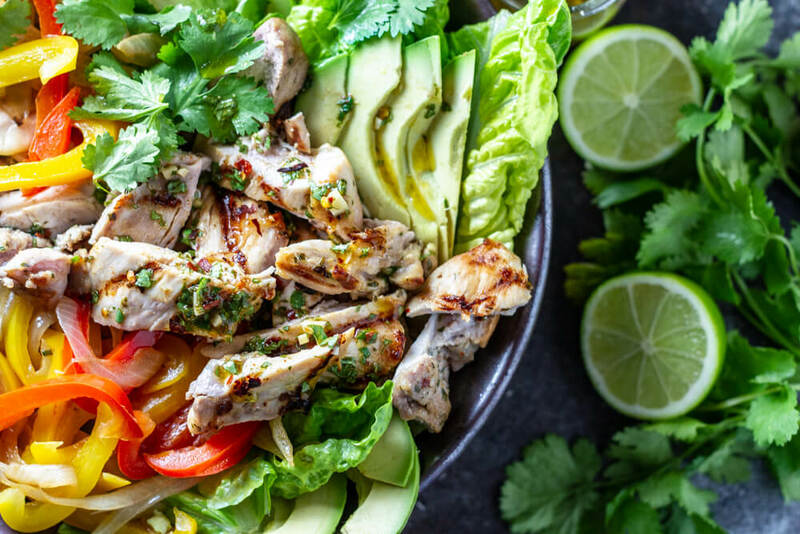 The multi-tasking, zesty cilantro lime dressing doubles as a marinade for the chicken. Simply divide in half and use half to marinade the chicken and reserve the other half for dressing the salad. …crunchy lettuce. I love using romaine lettuce for crunchy salads. For a lighter-colored lettuce green, it’s surprisingly full of antioxidants and crucial vitamins and minerals including folate, manganese, and vitamins A, K, and C. Feel free to add or use any salad greens that you like. …avocado. Healthy fats. We all need more of those. Plus avo makes everything better. …cilantro. You either love it or hate it. I’m in the LOVE group. 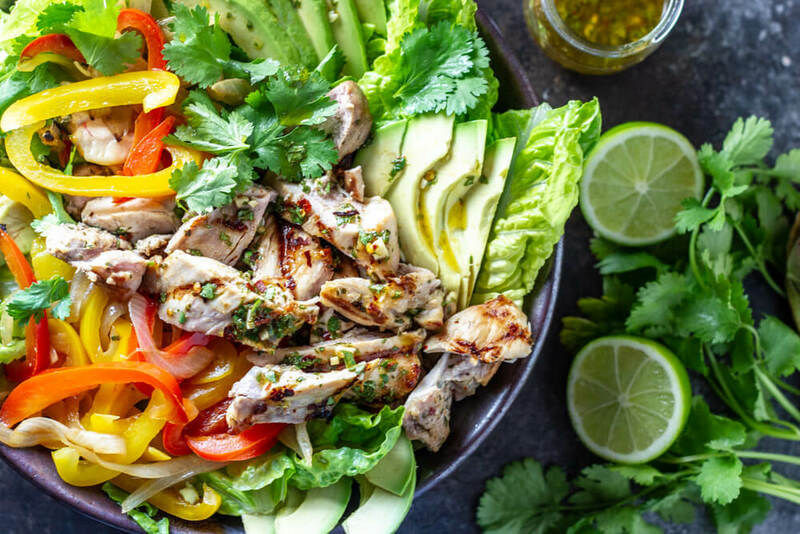 Cilantro not only gives this salad a nice POP of flavor, it adds some important nutrients and antioxidants and is known to help detox the body of heavy metals. …peppers and onions. Sauteed to perfection, these veggies add color and flavor. …juicy chicken. 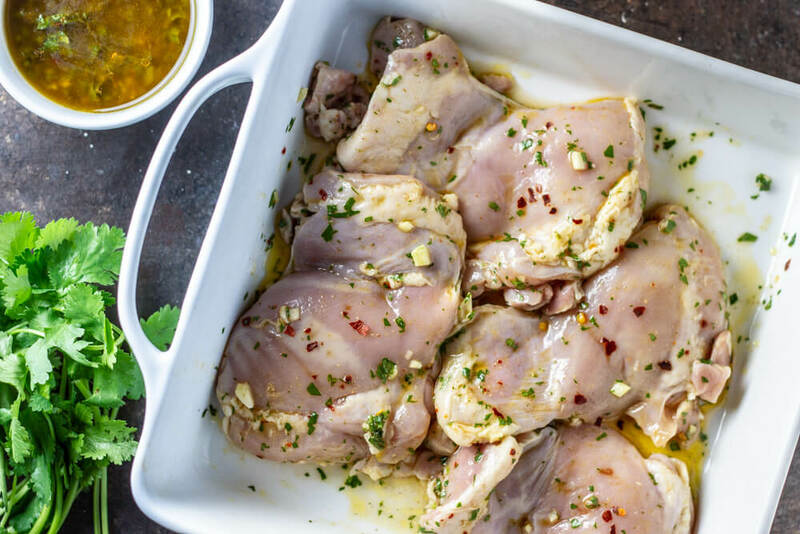 Marinated chicken thighs busting with flavor add a nice good-quality protein to keep you full and satisfied. I grill mine on a cast iron grill pan, but any heavy bottom skillet will do. What you end up with is a fresh and vibrant take on a traditional favorite Latin-flavored meal. You get all those vegetables, healthy fats and proteins in all at once. It’s definitely a meal you can feel good about serving again and again. And once you pre-marinate the chicken, it takes only 20 minutes to get on the table. This salad makes an awesome meal prep for the week. Simply store ingredients separately until read to eat. Happy Spring! Hope the sun is shining wherever you are. 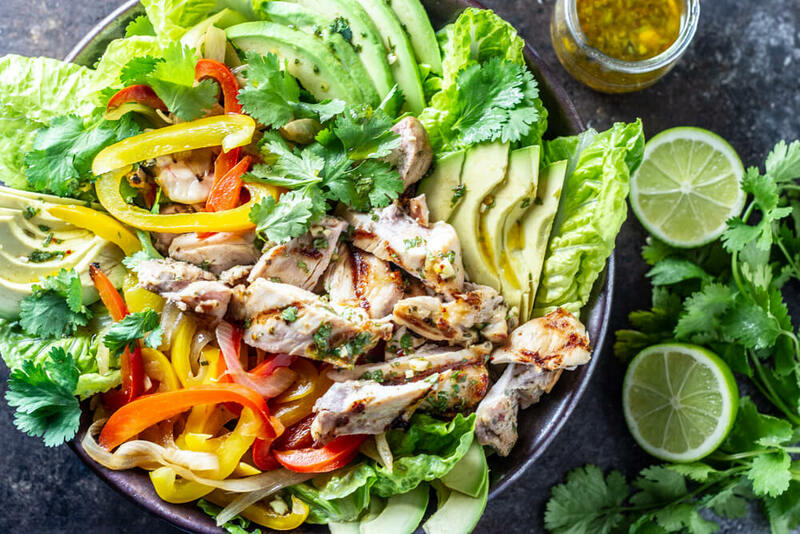 A big fat salad loaded with sauteed bell peppers and onions, avocado, cilantro, juicy chicken, and crunchy romaine. Ready in 20 minutes. 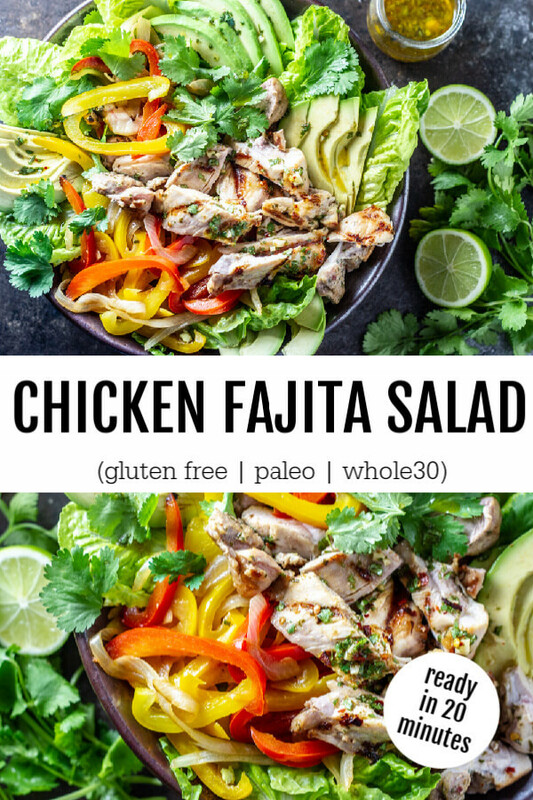 Gluten free, paleo, and Whole30. Whisk all dressing ingredients together until well incorporated. Place chicken thighs into a small glass bowl and pour HALF of the dressing over and mix to thoroughly coat. Cover and place in fridge to marinate for at least 2 hours and up to overnight. Place remaining HALF of dressing into airtight glass jar in fridge until ready to use. When ready to cook, melt 1 tablespoon of fat of choice on griddle pan or regular skillet until hot. 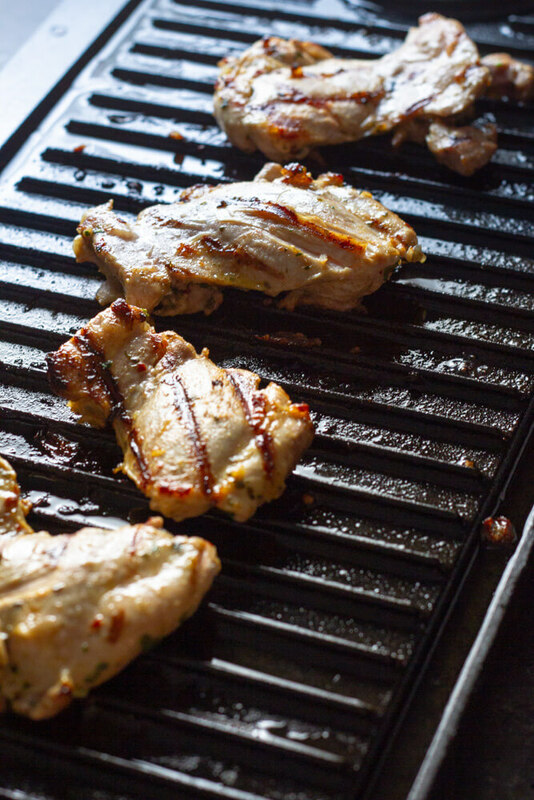 Place marinated chicken thighs into pan and cook for 4-5 minutes, until nice and golden. Flip and cook until chicken is cooked all the way through. Remove from pan and allow to rest for 5 minutes before slicing. In same pan or another skillet, add additional 1 tablespoon of fat and saute peppers and onions until done to your liking. To assemble salad- arrange romaine, cilantro and avocado into a large bowl. Add sauteed veggies and sliced chicken. Drizzle with remaining dressing. For individual servings, arrange ingredients into smaller bowls. For meal prep, keep ingredients separate and salad undressed until ready to eat. I prefer thigh meat for this recipe because it’s always so much juicer. You can use chicken breasts as well. Just be sure not to overcook. I mention limes in the dressing recipe, but I have also made the dressing with a combo of lime, orange, and lemon juice. It all works. I use romaine lettuce because it’s so nice and crunchy, but feel free to use any lettuce green that you like. Made this delicious salad today and will be making it all summer long! It’s a perfect Keto meal and non-keto family will love it as well! Thank you so much.